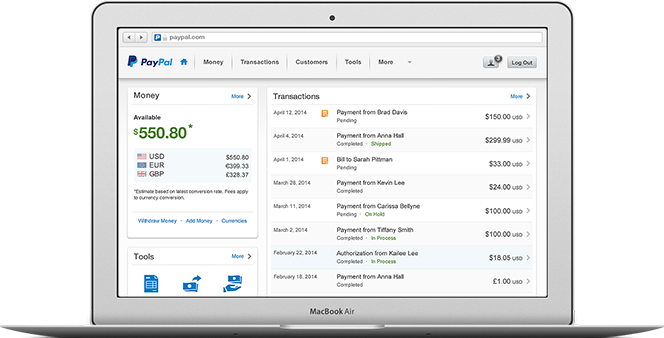 Optimise your business with your PayPal account. Enjoy peace of mind. Seller Protection helps safeguard you from losses on eligible transactions. In addition, we also have 24-hour transaction monitoring and advanced encryption. Once you’ve confirmed your financial details, you can send payments and withdraw money from your PayPal account to remove sending and withdrawal limits. Keep your contact and business details up-to-date. Enable multiple staff access to your business account. Tailor your selling tools. Track and measure your business performance. Create a professional invoice template in minutes. Use the template to send your future invoices quickly and easily. Add PayPal logos and banners to your site so your customers know that you accept PayPal.